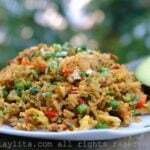 I love avocados, and I love stuffing them. I consider avocados to be one of those perfect foods; they’re delicious, visually appealing, and good for you. After this week’s Thanksgiving feasts, plus all the leftovers we ate yesterday; I wanted to make something refreshing and healthy. And, I still had some leftover turkey which need to be used, plus some beautiful perfectly ripe avocados. 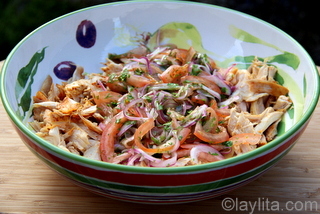 I made a tomato and onion lime marinated salad, also known as a curtido, and mixed it with some shredded turkey. Then I stuffed the salad into the avocados and served them on a bed of greens. I used arugula, but you can also use mixed greens, plain lettuce, spinach, etc. 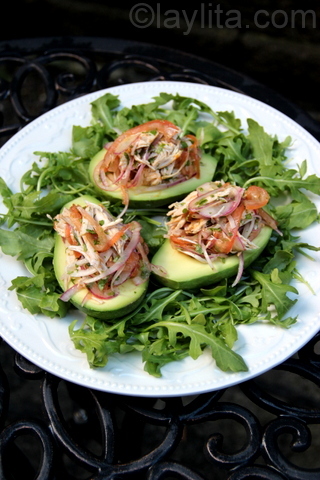 Ripe avocados stuffed with a refreshing salad made with turkey (or chicken), tomato, onion, cilantro, and lime. Place the onion slices in a bowl and sprinkle with about 1 tbsp. salt, use your hands to rub the salt into the onion slices. 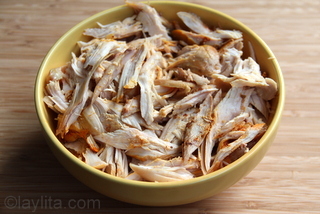 Cover with lukewarm water and let rest for 10-20 minutes. Rinse the onions well with cold water and drain. This will help remove the bitterness of the onions and also helps them marinate better with the lime juice. Add the lime juice from 3 ½ limes to the onions. Save ½ lime to drizzle over the avocados. Let the onions marinate with the lime juice and a sprinkle of salt for about 10 minutes. Add the sliced tomatoes, chopped cilantro and olive oil to the onions, mix well. 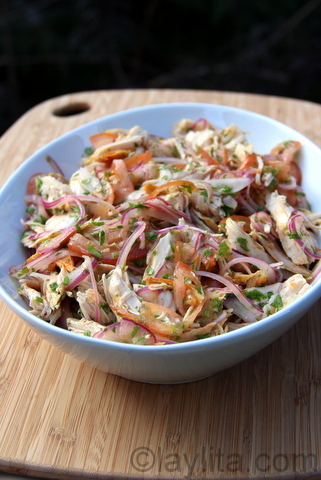 Mix the onion and tomato salad with the shredded turkey. Add salt/pepper to taste. Cut the avocados in half, remove the seeds, and peel carefully. 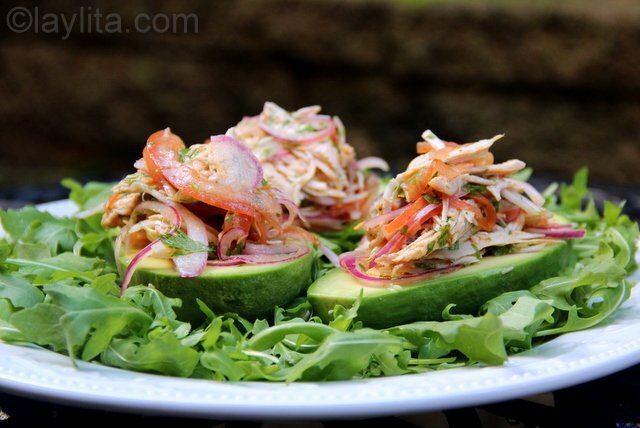 Drizzle remaining lime juice over the avocados, this prevents them from darkening. 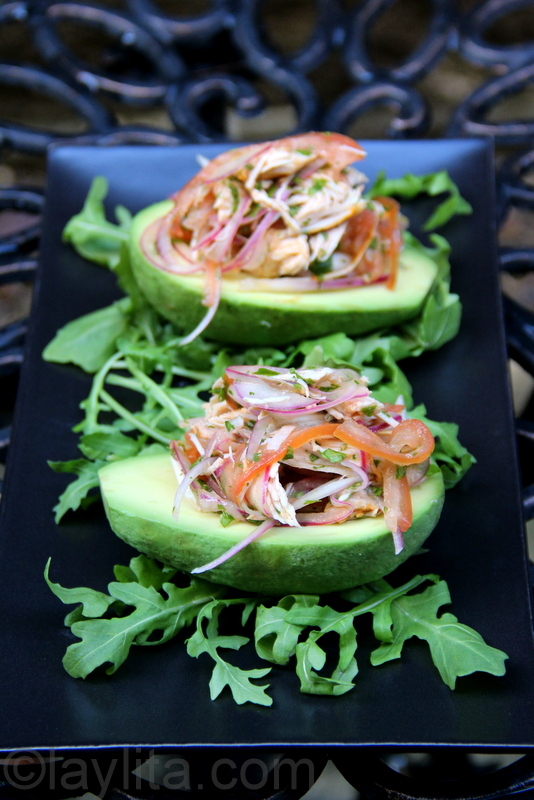 Use a spoon to stuff avocados with turkey (or chicken) salad filling. Serve immediately on a bed of salad greens. 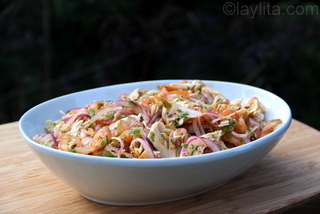 The turkey salad can be prepared ahead; in fact, it tastes even better after marinating for a little with the onions and tomato. 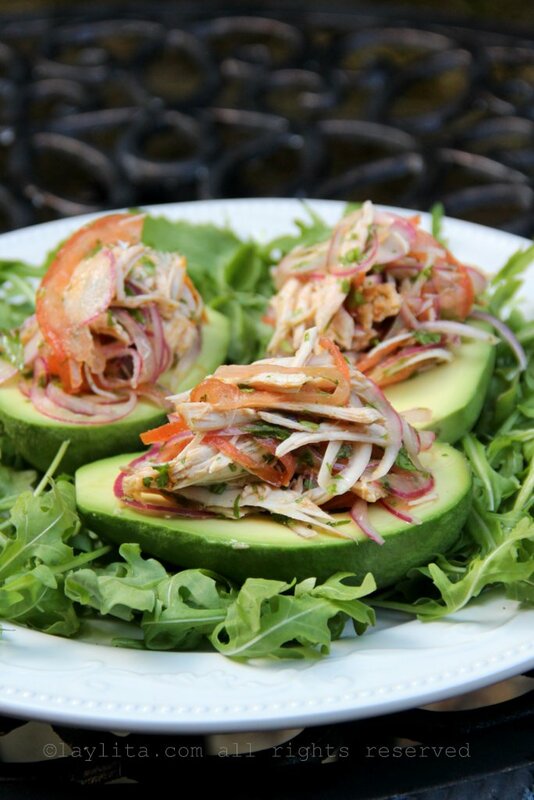 The avocados should be cut and peeled right before you ready to serve to keep them darkening, I also drizzle a little bit of lime juice on top of the avocados to prevent darkening. 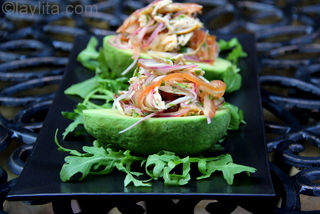 This recipe will yield 10 stuffed avocado halves, which can serve 10 people as an appetizer or small salad. 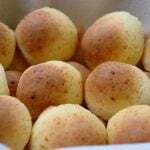 You can also serve it as an entree salad or main meal, in which case you would serve 2 halves to each person and will have enough for 5 people. 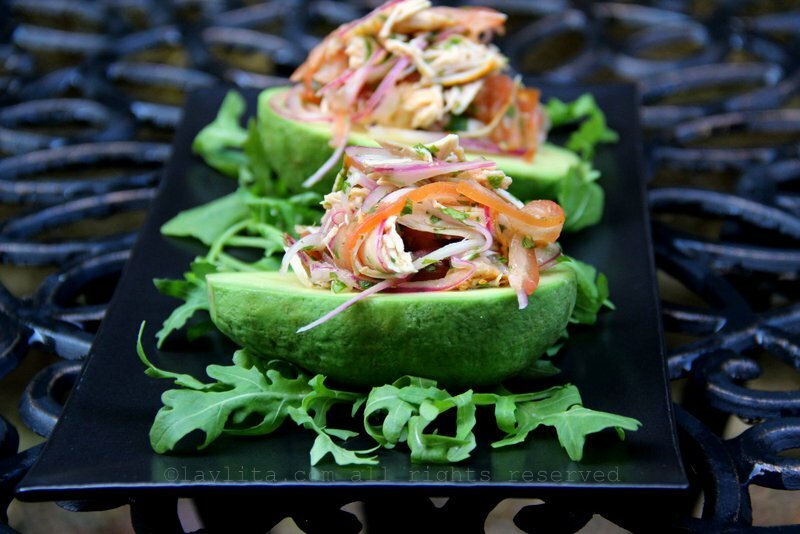 This stuffed avocado can also be made using shredded chicken instead of turkey.